Do you like comic books? Love live-action role play? Do you love cosplay? Jousting? Drawing? 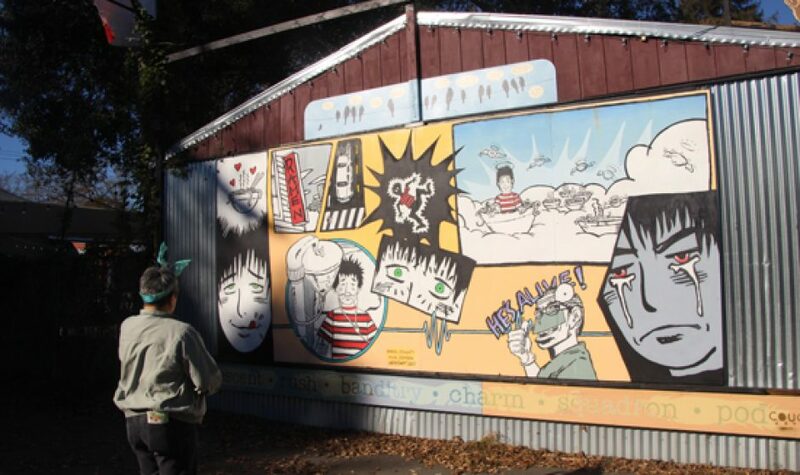 Then LumaCon, Petaluma’s own annual youth comic convention, is for you. LumaCon is held the fourth weekend in January, in Petaluma, and this year it took place at Luccesi Park. The convention’s founders include the Petaluma Library, Casa Grande High School, Friends of the Library and the Charles Schulz Museum and Education Center. Copperfield’s Books is also a great partner. The inaugural event in 2015 overflowed its venue at the fairgrounds, and this year’s space was perfect; big enough for separation for quieter events like panels and a Magic; the Gathering tournament, cozy enough to feel like you could see everything and not get lost. The majority of the action took place in the large meeting space called the Assembly. I’ll have more, and more photos, in an upcoming post. next to you. What a great opportunity for a young artist. You could also wander around the lobby and visit tables set up by Friends of the Library, Copperfield’s Books, or several Sonoma County comic book stores, including my favorite, Brian’s Comics. I have to take a minute to credit the Sonoma County Library here, for their approach to comic books. They realize that for many young people, comics are a “gateway” to reading. As one panelist said, when he was a youngster, he read the Classics Illustrated version of Treasure Island. He really liked it. His mom handed him the book and said, “Here’s the extended version.” Far from treating comics, collections and graphic novels as the enemy, the library includes them as fiction, as poetry and as literature. It probably doesn’t hurt that we live in the county with the Charles Shulz Museum. The helpful friendly owners and staff of Brian’s Comics. The TARDIS and a Weeping Angel. The Angel won an award. Definitely most of the 1500+ 3000 attendees were young. Many of the folks in the dealers room were young artists, creating and distributing comics via Tumblr and the internet, some the old-school way, via paper zines. This year’s clock tower logo was drawn by a teen artist who won the logo contest. Some formerly independent writers, like Alexis E Fajardo, are seeing their work picked up by conventional publishers. Fajardo created Kid Beowulf, which uses the premise that Beowulf and Grendel were half-brothers. One thing you learn in an afternoon at LumaCon is that there are many paths to success. I love the energy of this event. The planners have scaled it exactly right; it’s one day, it’s free admission (but there are donation boxes around, and you can donate. Check out the donation page on their website.) They are aiming at the right audience — youth. (Okay, and, well, me.) They are celebrating storytelling and creativity. And they are hosting fun.